Rock Wren, Salpinctes obsoletus at Jim Gray's Petrified Wood Co. in Holbrook, Arizona, from last April while on a family road trip through Arizona. I was drawing in the car, waiting for the rest of my family to finish their browsing in Jim Gray 's. I was in the car because overall I'm not a big fan of shopping. Or stores in general. I consider myself to be fairly browse challenged (though I have to admit this store was pretty cool to browse through) I'd like to say I was waiting patiently, but I'm sort of squirmy. 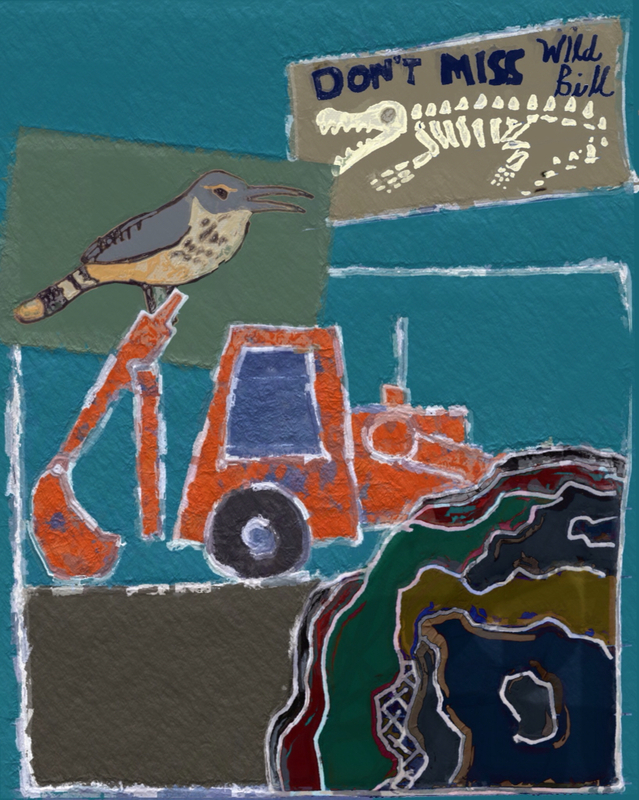 During my wait a Rock Wren was perched on a back hoe sort of thing, singing non-stop. Rock Wrens are known for their large repertoire of songs and this one seemed intent of showcasing its entire catalogue. While enjoying its performance, I was struck by how odd the overall scene was. First, dominating the picture was this little bird, one of the smallest details present, perched on top of a machine much larger, more powerful, and potentially louder; but despite its ability to dominate the scene,the back hoe was just a stage for the Rock Wren's performance. The back drop was a sign advertising "Wild Bill", a 1.2 million year old fossilized alligator who hung out somewhere in the rock store. Pretty casual - but to try and imagine a time span of over a million years is impossible, it defying our senses and imagination. But even more mind boggling was the 200 + million year old petrified log laying in the parking lot next to our car. Beyond ancient, it displayed arresting colors and complex patterns that formed an abstracted visual record of the past. Yet there it was just lying in a parking lot, with me impatient over a few minutes of waiting, while listening to this bird singing, each song ephemeral and on the time scale of seconds but just as colorful and complex as my mineralized companion in the parking lot.